Zenique 小茶栽堂 is a Taiwanese homegrown tea company that was established back in 2006 which boasts to produce organically-grown tea without the use of chemicals and pesticides. Like many other popular tea names, Zenique also has their own range of unique tea concoctions specially tailored for their local market to incorporate ingredients familiar to the Taiwanese, like osmanthus, ginger and lemongrass. 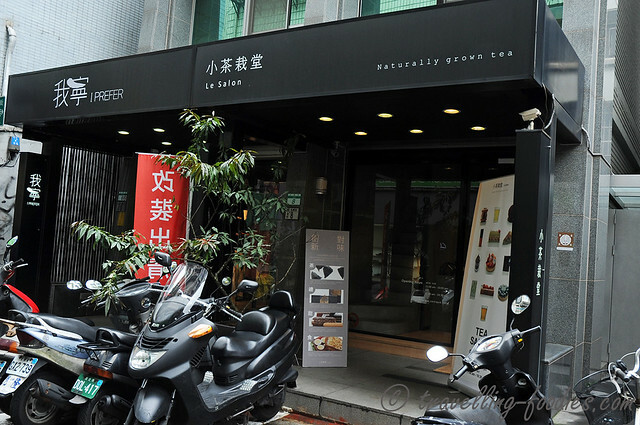 In 2011, they reconceptualised their tea business into a “lifestyle concept”, and opened their first Salon de The in Yongkang Street Taipei. 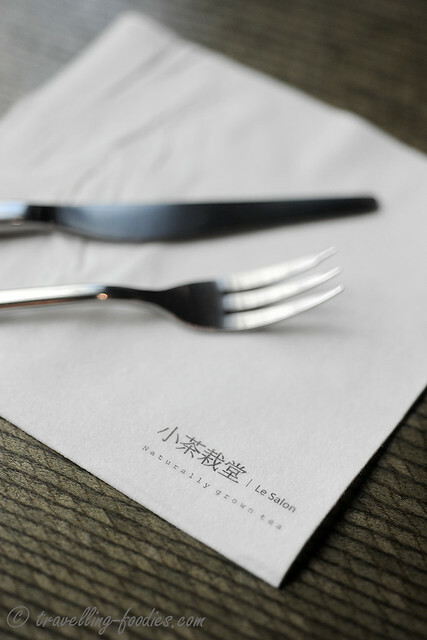 We visited them twice during our annual visits to Taipei and this blog post is a consolidation of both visits. 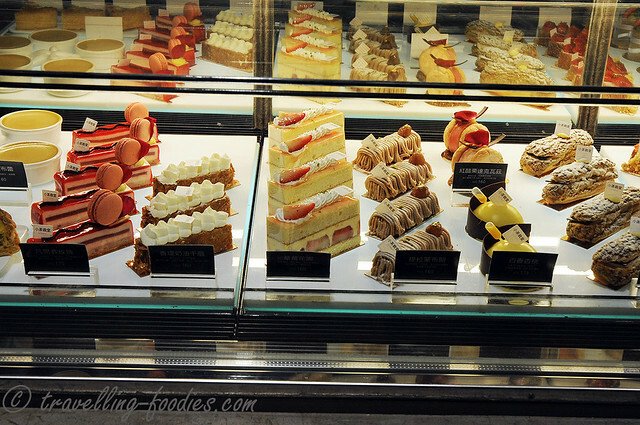 As we enter, we were greeted by a wall of teas on the right and a showcase of delectable cakes on the left. Naturally our eyes are glued on the pastries! 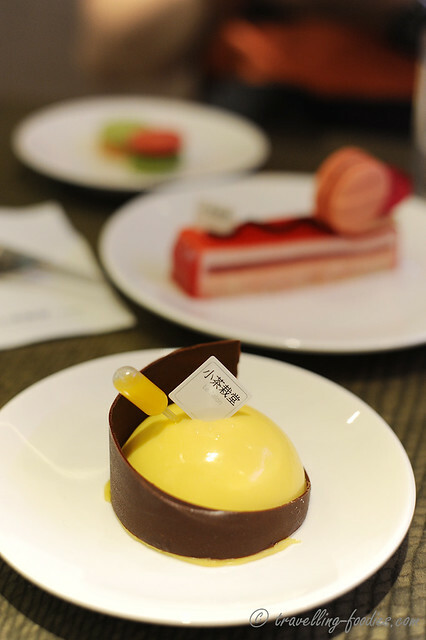 果香欧培拉 Opera aux fruits – We ordered this because we were intrigued by the name. Calling it an “Opera” seems to be somewhat of a misnomer, since it defers quite significantly from the famed French classic. The banana sponge layers were a lot thicker than what one would expect from an Opera gateau. Curious it seems, the mango sponge had mango infused creme chantilly in between while the 70% dark chocolate on top was flavoured with passion fruit it seems. One can taste the tangy notes from citrus fruits when taking a bite but couldn’t quite make out which component in the construction of this sliced entremet was it incorporated. Given the number of fruity components that were used, calling it an Opera aux fruits may not be exactly a wrong thing though one’s impression of the piece from what one would have expected from the name couldn’t have been greater. 果香红茶 Valse Thé Noir – Being essentially a teashop, many of their delectables have tea-infused into them and “Valse The Noir” is one of them. The base is a biscuit joconde au thé noir with a mousse made up of various fruits like strawberries, blueberries and kiwi (supposedly) as well as a gelee flavoured with honey and milk tea. The composition itself sounds rather bizarre if you ask me but the cake tasted surprisingly pleasant and most definitely not as obtrusive as it sounds. I like the simplicity of the decor with the macaron on top as a bonus of course. I’m glad that the seemingly experimental approach to the composition of this piece worked out quite well for us. 百香杏桃 Mousse fruit de la passion. A seasonal item which was newly launched when we visited. 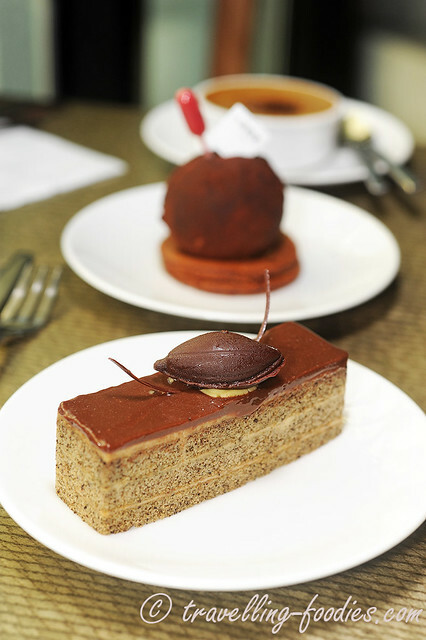 Shaped like a dome, it is essentially a petit gateau which marries passion fruit and apricots. 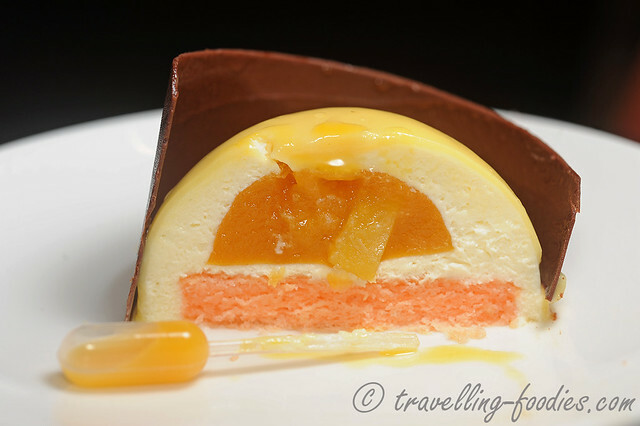 The components include a passion fruit mousse, a passion fruit and apricot gelee with bits of apricot embedded within, as well as a pink layer of gateau a la cuillere. Being a lover of anything sour, zesty and tangy, I took to this piece very well naturally. I like how the components are structured internally The mousse was delightfully light and smooth though I would have liked the finger sponge to be a tad thinner. The apricot bits added a nice textural touch against the gelee while the spritz of passion fruit couli administered through a plastic vial provided a “fun” hands-on component to it. 黑乌龙烤布蕾 Creme Brulee au Thé Oolong Noir – Another tea-infused piece which is one of Zenique’s signatures, unlike some of the other seasonal items, is available all year round. 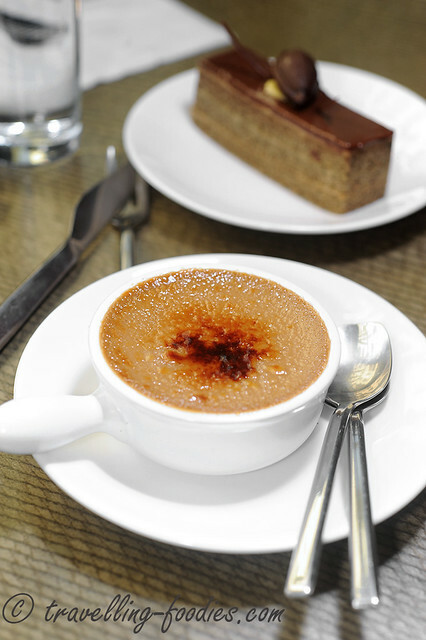 The creme brulee is served cold with a generous layer of bruleed sugar crystals on the surface. Generous on the sugar it might be, the caramelisation of the sugar is not executed properly. It seemed to suggest that the person who bruleed the custard layer in situ is either inexperienced or simply not one with is too bothered with details. The bulls eye of the piece is deeply caramelised while the sugar crystals on the rest of the surface had scarcely been caressed by the blow torch. Tastewise, I like the slight bitter aftertaste the Oolong tea offered, a good deviation from the standard egg and vanilla combination in a standard creme brulee. 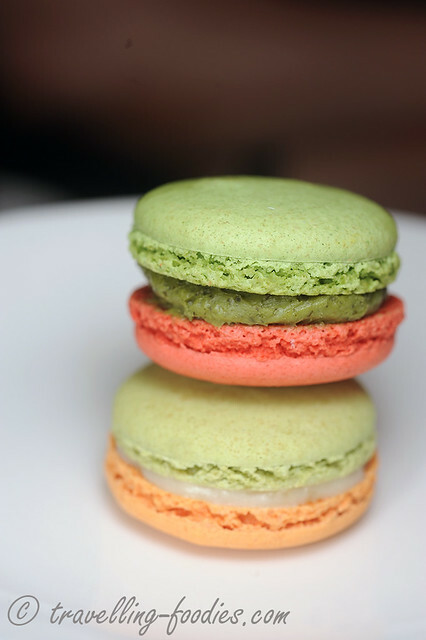 绿茶番石榴 Macaron au The Vert a la goyave (top) and 桂花柚子 Macaron au The osmanthus et pamplemousse. Their macaron selection was quite interesting to say the least. And we opt for two pieces which we were very curious about. Both are very pleasant to taste and highly played on aromatics, from the taste of guava and the floral bouquet of osmanthus. The green tea component in the former is lesser felt, with the citrusy zing from the grapefruit in the latter worked rather well against the osmanthus. This is the kind of innovation we would love to see continually. Kudos for the effort! 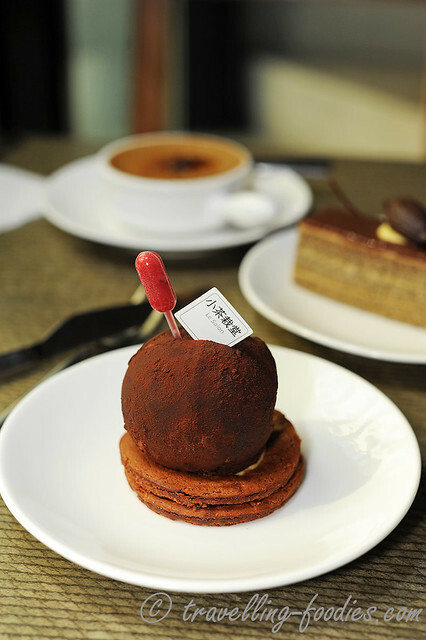 P125 巧克力松露球 Truffles aux chocolat P125 – we saved what we thought is the best for the last. It is essentially a ball of decadence, dark and silky ganache guised as a chocolate truffle with moist layers of chocolate sponge within. It tasted very rich and luxurious and I was glad we had it last or the flavours from the other pieces would have been thoroughly ran over by the chocolate goodness this piece is all about. Like the earlier piece, a contrast is provided as a spritz from a plastic vial filled with raspberry sauce. 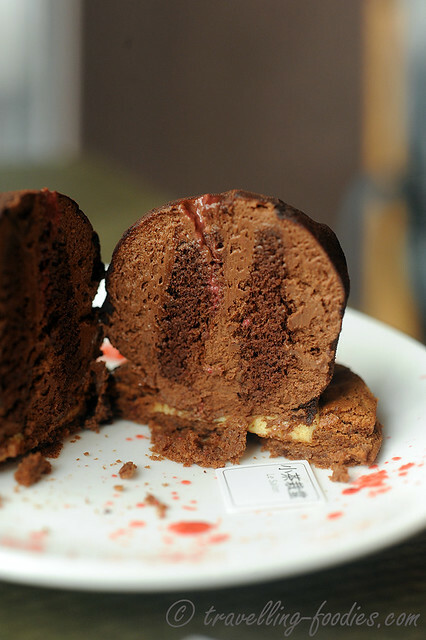 It is hoped that the tangy flavours from the raspberry would contrast the dark chocolate. I felt it could be a do or do-without, depending entirely on what the diner wishes for. On the whole, our experiences at Le Salon Zenique are very enjoyable ones. We most certainly hope to be continually surprised and our tastebuds constantly reinvigorated with future visits. I make an effort to support these small establishments ran by the young local crowd in pursuit of their dreams. I too once had a dream to open a patisserie myself and since it is kinda difficult to materialise my own now, let me help others fuel their dreams instead. This entry was posted on November 23, 2015 by Alan (travellingfoodies). 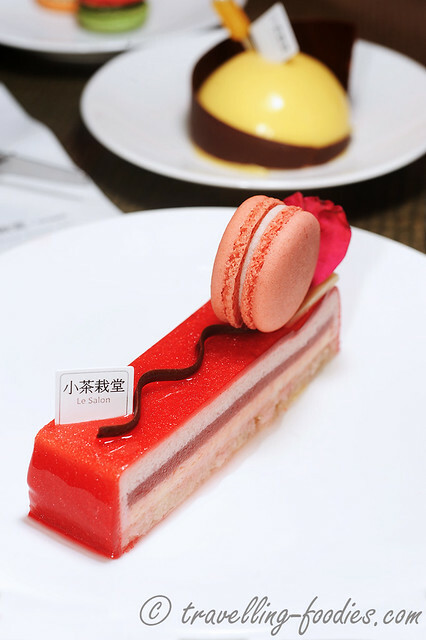 It was filed under Food, Travel and was tagged with cake, french pastry, Le Salon, pâtisserie, Salon de Thé, Taipei, tea infused, tea salon, yongkang street, 台北市, 小茶栽堂, 永康街.